With the Pioneer DDJ-SB3 Serato DJ controller, you get the design and feel of a classic DJ rig in a USB bus-powered controller. Larger than most models in its extremely affordable price range, the DDJ-SB3 gives you a pair of oversize aluminum jog wheels for tight scratching, 16 huge rubber pads, a 2-channel mixer, free Serato DJ Lite software, and more. 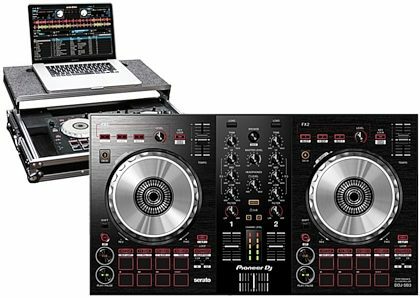 With a redesigned layout that's inspired by Pioneer's top-shelf DDJ-S series, the features and feel of the SB3 are typically only found in much higher-end controllers and enable a much more professional level of control. Plus the addition of FX Fade and Pad Scratch gives you more tools to create ear-catching accents and smooth transitions. Once again, Pioneer enables you to mix and scratch with pro-level precision, without breaking a sweat -- making the DDJ-SB3 a perfect introduction to the world of digital DJ controllers. The most noticeable upgrade to the SB3 may be its redesigned control layout, but look closer and you'll see a few features that add a lot more functionality. FX Fade is one addition to the SB3 that's a real game-changer when it comes to song transitions. By applying effects while simultaneously lowering the volume, FX Fade makes it dead easy to blend tracks and create smooth transitions, with your choice of eight combinations of four different FX patterns. Another cool addition to the SB3 is Pad Scratch. Developed with the legendary DJ Jazzy Jeff, Pad Scratch samples eight of his own scratch recordings, and allows you to apply them to currently playing songs without manually matching the BPM -- the SB3 matches the tempo for you automatically. The DDJ-SB3's hands-on controls and intuitive features are as straight-forward as they get, helping DJs to spend less time navigating their gear and more time getting their music out to the crowd. Novice and experienced DJs alike will quickly find their way around the controller, which sandwiches a two-channel mixer between two decks. Cue and Play/Pause are located on the left side of each deck in the bottom corner. Performance functions -- like Hot Cue, Loop, and Sampler -- are accessible within the included Serato DJ Lite software. If you want to get into the nitty-gritty of what the controller can do, you can do that from within Serato DJ Lite. Included as a free download, this DJ software gives you more ways to work with Hot Cues, Sampler, and other effects. Connect the DJ controller to your computer via USB and you're all set to go beyond basic functions like scratching and mixing. Advanced features like recording, additional Cue Points, samples, loops, extra FX, and more are available if you purchase the full version of Serato -- Serato DJ Pro. Work your DJ magic with the perfectly integrated Serato DJ Lite and DDJ-SB3 controller combo -- the software and the controller are made for each other. Pioneer has upgraded one of their most popular Serato DJ controllers to create the 2-channel DDJ-SB3, designed for dedicated use with Serato DJ Lite (previously known as Serato DJ Intro). The new controller offers an intuitive interface for beginner DJs to craft professional performances and improve their skills. The DDJ-SB3 improves on the renowned DDJ-SB2, which gained a strong reputation with a wide range of DJs - from beginners to pros - thanks to its combination of professional features and easy portability. The interface of the DDJ-SB3 is even more intuitive to use than its predecessors, inheriting traits from the layouts of the top models in the DDJ-S series including the introduction of the dedicated play and cue buttons, and the independent Auto Loop button. In collaboration with DJ Jazzy Jeff, we've created Pad Scratch. The brand-new feature on the DDJ-SB3 enables you to reproduce scratches based on the legendary hip hop DJ's own recordings by simply pressing the Performance Pads. Plus, smooth mixing is a breeze thanks to another new feature, FX Fade. You can use these features to create a professional performance, even if it's your first time behind the decks. DDJ-SB3 unlocks Serato DJ Lite for free (after free download) when plugged into the software. - Built-in sound card (audio interface) - plug and play by simply connecting the controller to your laptop using a single USB cable. - Class compliant - no need to install a driver. - Mic input circuit - clear audio without distortion, even with high input level. - Grab handles on both sides - easy to carry. - Paid upgrade to Serato DJ Pro (previously known as Serato DJ) - for more professional DJ performances. (available separately).